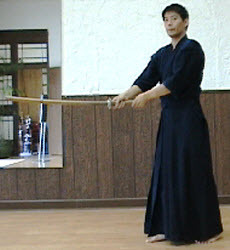 Kote strike (kote-uchi) is very easy after learning men strike. Basically you change the height of your sword when you strike since kote is lower than men. 1. Lift up our hands high enough from chudan so that you can see your opponent's kote and take a step forwards onto the right foot on the command, "Ichi!". 2. Strike kote on the command, "Ni!" 3. Take a step backwards and go back to chudan on the command, "San!" Repeat 2 to 4 until a commander shouts "Yame (Stop)". The practitioners shout, "Kote!" as striking a kote on a command, Ni!. We do not lift up our hands as we do in a men strike. It is because we only cut a wrist, we do not need as much strength as we need in a men strike. This is an important concept to learn at the beginning. It is because many beginners strike a kote very hard and the receiver literally have a swollen right wrist. Receivers (usually instructors or the advanced) receive many kote strikes per session. If there is even one person who strikes kote really hard, recievers will suffer for the rest of the training session. It surely hurts a certain amount, but people should not strike kote as if they are striking men. 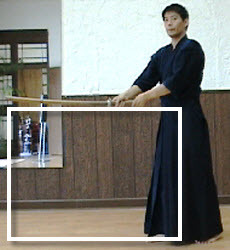 In order for beginners to learn how to strike kote properly, it is necessary to tell them why they do not have to strike kote as hard as men. It is parallel to the floor. 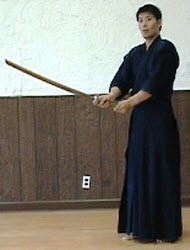 Many beginners do not know how low their sword should be when they strike kote. 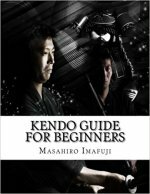 It is important for instructors to go in front of the beginners. And place the sword of the beginners on his/her kote. Usually it is parallel to the floor. It is helpful to remember especially when we practice on our own at home. This is used to let practitioners know the process, how far they should lift their hands and the height of kote strike. 1. Lift up our hands high enough from chudan so that we can see our opponent's kote and take a step forwards onto the right foot and strike kote on the command, "Ichi!". 2. Take a step backwards and go back to chudan on the command, "Ni!" 1. Nikyodo Kote Uchi, Hajime! The practitioners shout, "Kote!" as striking a kote on the command, Ichi! 1. Lift up our hands from chudan high enough so that we can see our opponent's kote and take a step forwards onto the right foot, strike kote, take a step backwards and go back to chudan on the command, "Ichi!". 1. Ikkyodo Kote Uchi, Hajime! These are the methods of the really basic kote strike training.